Is Geography the Next Smart Beta? Factor Investing: Welfare improving or marketing fad? "(...) In August, the best performing index in their range was the SciBeta Developed Mid Cap Diversified Multi-Strategy index, with a relative return of 1.86 percent compared to the broad cap-weighted index. We have already seen this trend take hold with multi-factor ETFs launched by Amundi and Morgan Stanley in partnership with EDHEC’s Scientific Beta.. (...)"
"(...) Scientific Beta, an EDHEC-Risk Institute Venture, has published the August 2015 Smart Beta Performance Report. Among the highlights of this month's report: This month, the best performing index in the Developed World universe among smart factor indices is the SciBeta Developed Mid Cap Diversified Multi-Strategy index, with a relative return of 1.86% compared to the broad cap-weighted index, while the SciBeta Developed Large Cap Diversified Multi-Strategy index posts the lowest relative return (0.40%). "(…) Alternative equity beta investing has recently received increasing attention in the industry. Although products in this segment currently represent only a fraction in assets, there has been tremendous growth recently both in terms of assets under management, and – perhaps more strikingly – in terms of new product development. (…)"
"(...) The ‘EDHEC-Risk Smart Beta Day’ will showcase the latest conceptual advances and research results in smart beta investing. The one-day conference, organized by the EDHEC-Risk Institute in partnership with Scientific Beta, will focus on smart beta indexation and factor investing and smart beta solutions. It takes place in New York, NY, December 15. (...)"
"(…) While a growing body of evidence shows that it is possible to build ‘smart’ equity indices that outperform traditional market capitalisation-weighted indices, the same cannot be said for fixed income. So far, practical applications have yielded unconvincing results. (...) Felix Goltz, head of applied research at the EDHEC-Risk Institute, says: “Some strategies tend to privilege economic fundamentals rather than interest rate and credit risk. There seems to be story-telling around fundamentals, while there is no evidence that markets take them into account on a consistent basis.” (…)"
"(...) Between January and February 2014, EDHEC-Risk Institute carried out a survey among a representative sample of 128 investment professionals to identify their views and uses of alternative equity beta.. (...)"
"(...) The value of assets tracking the EDHEC-Risk Institute smart beta indices has topped $8bn, according to the French research centre. The value has tripled over the past year, particularly with the adoption of its Scientific Beta Multi-Beta Multi-Strategy offering. Now the research institute is looking to increase the level of indexed assets to over $12bn by the end of 2015. (...)"
"(...) Noël Amenc, chief executive at smart beta index provider ERI Scientific Beta, has said that smart beta can be seen as a “low-cost commoditisation” of active management. (...)"
"(...) There is confusion in the area of smart beta because investors cannot be sure whether data is real and accurate or marketing jargon, says Scientific Beta’s 2015 edition of the ‘Journal of Index Investing.’ In the ‘Robustness of Smart Beta Strategies,’ it says that more than five years of live track record shows that, whatever the region, the smart beta strategy implemented outperforms the corresponding cap-weighted indices by an average of 2.1 per cent. But it is in the light of one of the best live track records for smart beta indices that Scientific Beta says that whatever the quality of the live performances exhibited, they cannot replace an in-depth assessment by investors and their consultants of the long-term performances of these. (...)"
"(…) Smart beta experts, Professor Noel Amenc and Eric Shribini, revealed how far smart beta has progressed yesterday at an EDHEC-Risk Institute conference in London. They found that the first generation of smart beta strategies either tilted towards better-rewarded investment factors, or aimed at delivering better diversification than investors would get from a cap-weighted index. (...)"
"(...) Two recent EDHEC Risk Institute surveys, Investor Interest in Smart Beta and Alternative Equity Beta Investing, throw some valuable light on what the early adopters are up to in the smart beta space. (...)"
Article par Noël Amenc, Directeur d'ERI Scientific Beta. "(...) Eric Shirbini, global product specialist at ERI Scientific Beta, the indexing venture launched by Paris-based academic institution EDHEC-Risk Institute, said: “We’ve seen products launching at very low fees – at cost or perhaps even slightly below – just to attract assets.” This is generally good news for investors but there is a danger that providers develop more complex products just to maintain their margins. (...)"
"(…) L’EDHEC-Risk Institute, institut de recherche sur la finance, a fait sa réputation. « C’est grâce à cette expertise que le gouvernement singapourien nous a choisis pour implanter un campus d’excellence et un centre de recherche en la matière à Singapour [en 2011] », explique Olivier Oger, directeur de l’EDHEC. (…)"
"(...) Le mois d’octobre n’a pas épargné les stratégies indicielles smart beta, souligne l’équipe de l’ERI-Scientific Beta (de l’EDHEC-Risk Institute), dans leur rapport de performance pour le mois dernier. Cela dit, les stratégies factorielles continuent de surperformer les indices capi-pondérés... (...)"
"(...) Secondly, Singapore wants to develop benchmarks, data and analyses of performance and risks that institutional investors need to make infrastructure investment decisions. For instance, EDHEC, a French business school with a Singapore arm, has done fundamental research on infrastructure asset pricing, and is in the process of creating usable performance benchmarks for long-term infrastructure debt and equity instruments. (...)"
"(…) Merrill Lynch Wealth Management is teaming up with France’s EDHEC Business School to develop new research on risk allocation and goals based investing (…)"
"(...) EDHEC-Risk Institute has surveyed 109 institutional investors from across Europe, including Europe’s largest pension and reserve funds, insurance and provident institutions and their asset management subsidiaries, to document their expectations and requirements with respect to index transparency and take stock of their perceptions of, and the extent of their support for, the main directions of the ongoing regulatory debate on indexing and financial benchmarks. (...)"
"(...) Europe’s EDHEC-Risk academic institute is stepping up a campaign to force asset managers to disclose the stocks they use in “smart beta” indices – potentially disclosing the “secret sauce” they use in attempts to outperform conventional benchmarks. 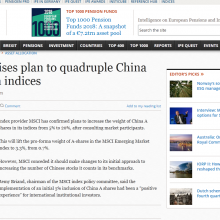 (...)"
"(...) EDHEC-Risk Institute, a business school with offices from Singapore to London, has said the industry must improve transparency in their index selection. The school promotes about 3,000 smart-beta indexes. (...)"
"(…) Amundi, a leading European asset manager and provider of exchange-traded funds (ETFs), and ERI Scientific Beta, a smart beta index provider and affiliate of the EDHEC-Risk Institute, have announced a strategic partnership that will combine ERI Scientific Beta’s expertise in the design of smart beta indices and Amundi’s know-how in index replication and ETF construction. "(…) With high levels of demand for corporate bonds, the EDHEC-Risk Institute considers why these assets are good for both performance-seeking and liability-hedging portfolios. "(...) The institute has also called for high and uniform standards of transparency to allow investors to make informed decisions and promote integrity, competition and innovation in the indexing industry. (...)"
"(...) EDHEC Research Institute’s ETF arm, ERI Scientific Beta, launched 72 smart-beta indexes on April 30, dubbing the offering the Multi-Beta Multi-Strategy Indices. These smart-beta indexes seek to avoid overconcentration and exposure to systematic risk, both downfalls of market-capitalization-weighted indexes, by following strategies reflecting value, momentum, size and low volatility to ensure diversification. 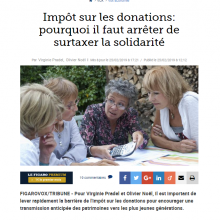 (...)"
"(…) Issue des travaux de la Chaire de Recherche de Lyxor dédiée aux « Solutions d'allocation du risque », la dernière publication de l' EDHEC-Risk Institute met en évidence une nouvelle génération de stratégies de parité du risque (« risk parity ») qui tient compte de mesures de risque plus appropriées que la volatilité historique. (…)"
"(...) An EDHEC-Risk Institute study from the Lyxor research chair on “Risk Allocation Solutions” develops a conditional approach to risk parity, which contrasts with standard unconditional risk parity portfolios. (...)"
"A study published in February by EDHEC-Risk Institute of 104 mainly European investors found that 80% understood the LDI approach, and 51% overall (and a large majority in the UK) implemented a formal separation of return-seeking assets and those held to match liabilities. Interest rate risk is the main concern of those investors who do hedge against unexpected changes in risk. (...)"
"(...) Amundi has unveiled its first smart beta exchange traded fund tracking an index provided by ERI Scientific Beta. (...)"
"(...) Morgan Stanley has launched its first exchange traded fund (ETF) which tracks a smart beta, equally weighted index from ERI Scientific Beta. (...)"
"(...) Some providers, such as MSCI and EDHEC-Risk, have put together different styles into multi-factor products in a bid to make performance more consistent. (...)"
"(…) ERI Scientific Beta, the smart beta index unit of the EDHEC-Risk Institute, has announced the make-up of its international executive management team covering Boston, London, Nice, Paris, Singapore and Tokyo. The team consists of Noël Amenc, Lionel Martellini, Patrice Retkowsky, Reynald Mauguin, Mélanie Ruiz, Candice Lebastard, Felix Goltz and Peter O’Kelly. (…)"
"(…) L'entité ERI Scientific Beta (EDHEC-Risk Institute) vient de lancer ses indices multi-Beta Multi- Stratégie (MBMS), disponibles sur la plate-forme www.scientificbeta.com. 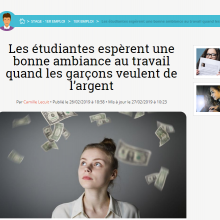 L'objectif de ces stratégies est de répondre favorablement aux deux principales limites des indices pondérés par la capitalisation, à savoir des expositions mal adaptées à des facteurs de risques systématiques et une concentration excessive dans un petit nombre de titres. (…)"
"(...) This has become such a problem that Europe’s EDHEC Risk academic institute wrote to Sharon Bowles MEP in March to demand that regulators apply closer scrutiny to smart beta financial benchmarks, forcing fund managers and index developers to disclose what is in these indices. 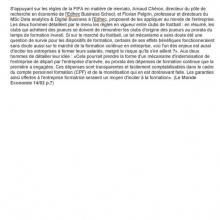 (...)"
"(...) Amundi, un des leaders mondiaux de la gestion d’actifs, et ERI Scientific Beta, ont conclu un partenariat stratégique pour combiner l’expertise du fournisseur d’indice Smart Beta, avec celle d’Amundi dans la réplication d’indices et la gestion d’ETF. (...)"
"(...) French academic institute EDHEC-Risk has compiled several smart beta indices. It reckons that allocations biased to low volatility, momentum, value and mid-cap styles can produce top-decile performance over time. (...)"
"(...) ERI Scientific Beta has announced that as of 30 April 2014 it has extended its smart beta indices offering to include a series of multi smart factor indices.. (...)"
"(...) EDHEC-Risk, the French research institute that is seeking to establish a presence as an index provider, points out that there are hurdles to the wider adoption of smart-beta strategies. (...)"
"(...) "Investors who want steady income are used to scrounging around trying to squeeze a little more cash flow out of their securities. Now Uncle Sam is coming to their aid. In January, the U.S. Treasury began issuing floating-rate notes or FRNs, the first major innovation in U.S. debt since inflation-protected securities were introduced in 1997. (...) The FRNs are probably most suitable for investors who are “trying to get a better interest rate over a specific time period,” says Frank Fabozzi, a bond expert who teaches finance at EDHEC Business School in Paris and Princeton University. (...)"
"(...) Exchange traded fund providers and industry experts have rejected accusations that a rise in the number of investors piling into passive strategies poses a systemic risk to financial markets. A recent speech given by one of the UK’s most senior bankers has reignited the debate about ETFs and their potential to cause market disruption. (...) Noel Amenc, director at the EDHEC Risk Institute, adds that the speech by Mr Haldane “assumes that all ETFs are trackers of the same indices”, which is not the case given the rise of so-called “smart” indices.(...)" "(...) The results of the EDHEC European ETF Survey 2013 suggest product development within certain asset classes has driven increases in ETF usage, notably within real estate, hedge funds and infrastructure. (...)"
"(…) The regulation of smart beta in Europe falls within the wider rules about passive investment. And investors are impatient for greater transparency, according to research presented at the same conference by Frédéric Ducoulombier, professor of finance at EDHEC Business School. (…)"
"(...) Institutional investors need to look carefully at the effectiveness of their portfolio diversification, says a publication from the EDHEC-Risk Institute. ‘Improved Risk Reporting with Factor-Based Diversification Measures’ says before the financial crisis, pension funds were insufficiently diversified, with concentration in a small number of asset categories. (...)"
"(...) The debate about whether socially responsible investment is financially rewarding has been raging for years. (...) Erik Christiansen, former head of SRI at ERAFP, the French public service additional pension scheme, says: “We have not observed an advantage (to SRI) empirically and I don’t see there is a theoretical basis for it to exist.” Mr Christiansen, who is now senior business development director for Europe at EDHEC-Risk, the French research institute, is in favour of sustainable investment, but says investors need to be clear “it is not something you should do from a financial point of view”. (...)"
"(…) Smart beta is similar to factor investing, a concept that has been around for some time. But they are two diff erent things. “With a traditional factor-based approach, there is greater exposure to stock-specifi c risk; you haven’t necessarily diversifi ed away other risks inherent in the traditional factor approach,” says Eric Shirbini, global product specialist at ERI Scienti fic Beta. (...)"
"(...) And in the fast-developing “smart beta” index market, competitive positions appear far less entrenched. (...) Noël Amenc, chief executive of EDHEC Scientific Beta, predicts: “The quality of the research underlying these new types of index, and thus the robustness of their records, will probably be the central issue in terms of competition within smart beta.” (...)"
"(…) European investors meanwhile are growing impatient. In a survey by EDHEC Business School, 81% of investors said the credibility of reported track records was undermined by providers' opacity, especially for newer types of index. (...) None of the major factors on which smart-beta funds are built came close to beating the market during the tech bubble. Research by EDHEC Business School shows that most advanced-beta strategies had a phase where they underperformed market cap by 10% over a period of between two and five years. (…)"
"(...) In a presentation last week at the EDHEC Risk Days Asia 2014 conference in Singapore, Lionel Martellini displayed a time series of the S&P 500 Index from 1958 to 2014 to demonstrate that the effective number of constituents (ENC) of the index at its highest is equal only to 260 individual stocks and at its lowest falls to just 120 individual stocks. (...)"
"(...) Longer term, the picture looks better. The “Scientific Beta” indices produced by the EDHEC-Risk Institute, widely followed in the industry, show that US low-vol stocks suffered a 47.8 per cent loss during the 2007-09 crisis, while the total return on the S&P 500 dipped by 54.9 per cent. (...)"
"(...) EDHEC has come up with a range of what it calls “scientific beta” indices. There are ETFs based on these indices; Morgan Stanley run them for institutions here in the UK while Amundi has recently launched a retail ETF that meets European “Ucits” rules on diversification and that trades on Euronext. These ETFs are great value and I think they are a brilliant core holding for anyone who wants to go one better than the DFA approach. They aim to combine value, size, low volatility and momentum strategies into one product, and exclude all those stocks that tend to underperform over a stock market cycle. 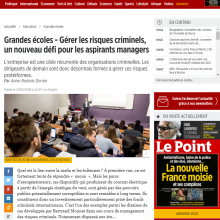 (...)"
Intervention de Bertrand Monnet, directeur de recherche à l'EDHEC Business School et titulaire de la chaire EDHEC Management des Risques Criminels. "(…) La dette « infrastructures » répond bien aux contraintes de gestion actif/passif des assureurs mais son risque ne doit pas être sous-estimé. (...) En attendant les premiers résultats académiques de la chaire "infrastructures" de l'EDHEC-Risk Institute, les investisseurs cherchent la bonne dose d'infrastructure à inclure dans leur allocation. (…)"
"(…) L'EDHEC-Risk Institute, qui a développé la gamme d'indices ERI Scientific Beta, a indiqué que sur le mois d'octobre le SciBeta Developed Low Volatility Diversified Multi-Strategy index a été le plus performant, avec un rendement relatif de 1,78% par rapport à l'ensemble des indices pondérés par la capitalisation." 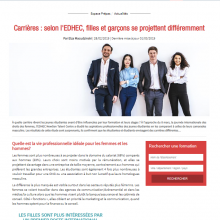 Article by Frédéric Blanc-Brude; Directeur de Recherche, EDHEC Risk Institute—Asia, and Frédéric Ducoulombier, Directeur, EDHEC Executive Education et Directeur EDHEC-Risk Institute Asia. "(...) Smart beta investing needs to go one step forward to help investors build diversified portfolios of passive funds, a research paper from French business school EDHEC has found.(...)" "(...) In June Amundi also unveiled its first smart beta ETF, which tracks an index provided by ERI Scientific Beta. The product, which was listed on Frankfurt’s stock exchange last month, is a multi smart beta ETF that tracks an equal risk contribution index blending four main risk factors with five smart beta diversification strategies. 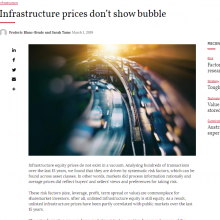 (...)"
"(…) Frédéric Blanc-Brude and Majid Hasan present a rigorous – yet implementable – framework for measuring the performance of private infrastructure debt. (...) Estimating the performance of infrastructure debt instruments has become a recurring question for both long-term investors and prudential regulators.. (…)"
Marché du travail : "On se rapproche du contrat unique de Sarkozy"
Interview d’Arnaud Chéron, directeur de recherche associé à l’EDHEC Business School. 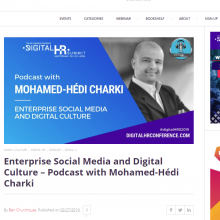 Interview de Cédric Manara, professeur de droit à l’EDHEC Business School et membre du centre de recherche LegalEdhec. "(...) The latest market volatility can only serve to remind investors in Asia about why they were paying attention to low- and minimum-volatility strategies in the first place, said Paul Hoff, the EDHEC Risk Institute's business development director, Asia-Pacific, from Tokyo, where he is setting up a new office. (...)"
"(...) Maddi Forrester, Axa Investment Managers: “In the UK specifically, our sponsored research with EDHEC concluded that the current hybrid model should be adapted to a collective system to benefit from greater risk sharing, economies of scale and better risk management. (...)"
"(...) EDHEC’s European ETF study in 2012 found that 67 per cent of the institutions planned to increase their use of ETFs and ETPs while only 4 per cent of the respondents expected their use of ETFs and ETPs to decline. (...)"
"(...) L'institut de recherche a mis en place une plate-forme d'indices « smart beta » qu'elle produit elle-même et qui accueillera jusqu'à 10.000 indices d'ici à dix-huit mois. (...)"
"(…) As Noël Amenc, director at EDHEC-Risk Institute says, index providers traditionally justify the use and costs of alternative benchmarks by claiming they outperform cap-weighted indices. (…)"
"(...) If you want an insight into some of the ideas that have been backtested and turned into indices, go to www.scientificbeta.com, a new website run by European investment research organisation called EDHEC Risk. (...)"
"(...) L’EDHEC-Risk Institute insiste sur le besoin de diversification des institutionnels souhaitant s’exposer aux « infrastructures », avec un peu de « greenfield ». (...)"
"(...) EDHEC-Risk Institute has inaugurated its new smart beta index design and production activity, ERI Scientific Beta. This activity aims to revolutionise the index world through, firstly, a new approach to smart beta investing called Smart Beta 2.0, which enables investors to choose and control the risks of these new benchmarks, and secondly, total transparency on the methodologies and compositions of the indices available on the platform. (...)"
"(…) EDHEC-Risk Institute's Frédéric Ducoulombier calls for full transparency of methodology and historical information for indices. In the context of the ongoing regulatory debate on financial benchmarks and the recent consultations by the International Organisation of Securities Commissions (IOSCO) and the European Securities and Markets Authority (ESMA)/European Banking Authority (EBA), EDHEC-Risk Institute wishes to underline that transparency is both crucial to allowing users to assess the risks, relevance and suitability of indices and the most powerful tool to mitigate conflicts of interest existing across the indexing industry (…)"
"(…) Le 22 avril, l'EDHEC-Risk Institute a démarré son activité de conception et de production d'indices de beta intelligent, ERI Scientific Beta, qui met en oeuvre des produits destinés à l'investissement Smart Beta 2.0, annonce l'EDHEC le 29 avril. (…)"
"(...) Noel Amenc, director of the EDHEC-Risk Institute, said different types of ETFs and indices could lead to more taxes being charged. He said: “If you have an actively managed ETF or invest in a strategy index, you have greater turnover. It could have a very strong negative impact.” (...)"
"(...) EuroPerformance et l'EDHEC-Risk Institute livrent la septième édition de l'Alpha League Table. Le dépassement de leur indice de référence a été difficile l'an dernier pour les gérants actions. (...)"
Les hedge funds coordonnés sous-performent les "non UCITS"
"(...) Par solde, les hedge funds coordonnés sont plus volatils et sous-performent leurs homologues qui ne sont pas conformes à la directive OPCVM, sachant que le domicile d'un fonds constitue un indicateur important de sa performance potentielle, ceux basés en Europe affichant une performance ajustée du risque inférieure à ceux enregistrés ailleurs. Tel est le résultat d'une enquête effectuée par l'EDHEC-Risk Institute sur un échantillon de plus de 24.000 hedge funds individuels. (...)"
"(...) Scientific Beta, the index platform of the EDHEC Risk Institute, intends to launch a new range of smart beta indices in 2014 to allow institutional investors to hedge against specific risks. (...)"
"(...) EDHEC-Risk Institute researchers, supported by Rothschild & Cie, have analysed the sources of added-value of corporate bonds for institutional investors. The paper, “Analysing and Decomposing the Sources of Added-Value of Corporate Bonds within Institutional Investors’ Portfolios,” which was produced as part of the research chair on “The Case for Inflation-Linked Corporate Bonds: Issuers’ and Investors’ Perspectives”, finds corporate bonds to be attractive additions to investors’ portfolios. (...)"
"(…) The costly future resulting from population ageing can still be affordable if scientific investment solutions are created to put the region's vast savings to work, said Dr. Frédéric Blanc-Brude, research director at EDHEC Risk Institute-Asia, speaking at the ninth conference on Asian pension and retirement planning in Singapore on September 4, which gathered thought leaders from global insurance firms and asset managers around Singapore's Central Provident Fund (CPF) and the OECD. (…)"
Article by Lionel Martellini, scientific director, and Vincent Milhau, deputy scientific director, at EDHEC-Risk Institute. "(...) "There is a disconnect between what the public sector expects from long-term investors--that they finance economic growth--and what institutional investors actually need: instruments offering significant diversification from capital market volatility, attractive yields and predictable long-term cash flows, preferably inflation-linked," says Frederic Blanc-Brude, research director at EDHEC Risk Institute in Singapore. (...)"
Who is afraid of construction risk? "(...) New research conducted by EDHEC-Risk Institute found that East Asia's vast private savings have so far failed to make their way into dedicated retirement packages. 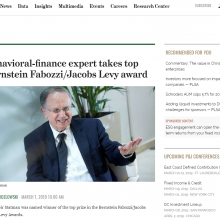 (...)"
"(...) The publication earlier this month of Iosco’s “principles for financial benchmarks” drew criticism from the Nice-based EDHEC-Risk Institute which itself is seeking to establish a presence as an index provider. (...)"
"(...) To tackle style bias, EDHEC, a French business school, offers what it inevitably calls “smart beta 2.0”—over 2,000 indices that allow investors to, for example, diversify exposure to one industry. 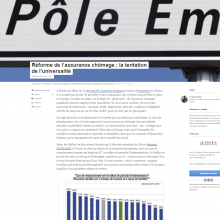 (...)"
"(…) Pension funds cannot be expected to provide long-term finance to the real economy, or invest in infrastructure or SMEs, if policymakers fail to provide them with the right instruments, EDHEC-Risk Institute has argued. (…)"
"(...) The ESMA guidelines restrict UCITS’ choice of indices to those that are built and managed in a systematic manner and for which index providers avail of full and complimentary transparency of both methodology and historical information; they also require UCITS to perform documented due diligence on the quality of indices. This level of transparency corresponds to that advocated by EDHEC-Risk Institute as it allows investors to independently replicate the track record of an index, gauge the systematic character of its methodology and conduct performance and risk analyses to assess its relevance and suitability against specific investment and risk management goals. (...)"
"(...) Toute controversée qu'elle soit, la stratégie dite de la parité des risques (Risk parity) dans la gestion d'actifs gagne en visibilité. L'EDHEC-Risk Institute, centre de recherche de l'école de commerce, et la société de gestion Lyxor, filiale de la Société Générale, semblent en être convaincus au point qu'ils ont annoncé, lundi 7 octobre, le lancement pour trois ans d'une chaire de recherche commune dans ce domaine. (...)"
"(...) EDHEC-Risk Institute and Lyxor are launching a three-year research chair entitled “Risk Allocation Solutions” to develop academic insights that can be used towards the design of high-performance multi-asset investment solutions, based on specific investor needs. (...)"